Scapholunate dissociation is generally from trauma, but may occur from calcium pyrophosphate deposition. Most common cause of wrist arthritis. 57% of degenerative wrist arthritis (Watson HR, Ballet FL. Journal of Hand Surgery 1984;9A, No. 3 May 1984). 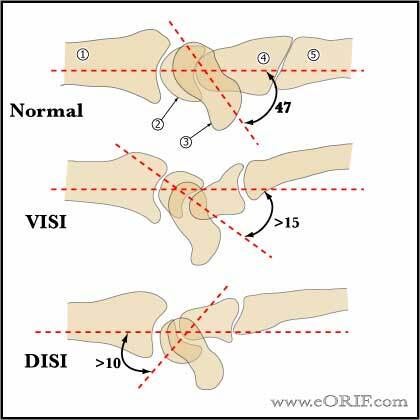 Variable degrees of wrist pain, swelling and decreased ROM. Advanced disease is associated with night pain. May have remote history of wrist trauma. Degenerative changes progress from the radial styloid and scaphoid along the scaphoradial joint. Lateralradiographs may show the scapholunate angle to be increased beyond 60°, which is felt to be the upper limit of normal. Normal scapholunate angle=47 range=30-60 degrees. Carpal height Index= distance between the base of the third metacarpal and the articular surface of the radius divided by the length of the third metacarpal on a neutral P/A xrays. Normal = 0.54 +/- 0.03. Best evaluated by comparing Carpal height index to that of the normal side. (Mann Fa, Radiology 1992;184:15). Can also compare carpal height index using the height of the capitate. Normal using capitate = 1.57 +/- 0.05. Stage I=degenerative changes (narrowing/sclerosis) in scaphoid tip (narrowing and beaking). Treatment: scaphocapitate or scaphotrapeziotrapezoid fusion with resection of the radial styloid. 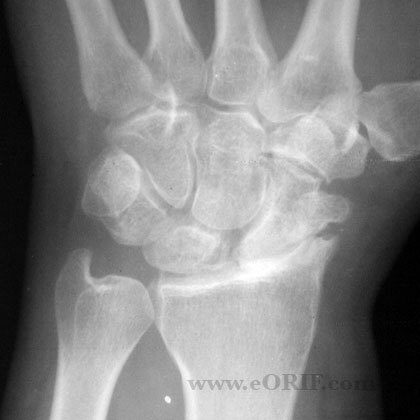 Stage II=degenerative changes in entire scaphoid fossa. Stage III=degenerative changes in capitolunate joint and scaphoid fossa. 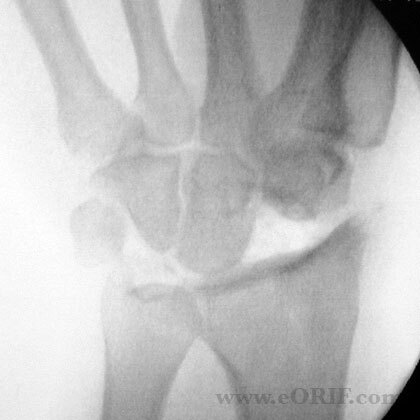 Treatment: proximal row carpectomy vs scaphoid excision andlunate-capitate-hamate-triquetral (four-corner) arthrodesis. 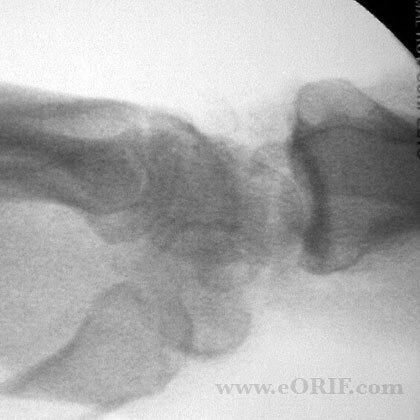 Arthrodesis is favored due to arthritic changes in the capitate. Stage IV=degenerative changes in entire wrist. Treatment:total wrist arthrodesis vs proximal row carpectomy vs scaphoid excision and lunate-capitate-hamate-triquetral (four-corner) arthrodesis. 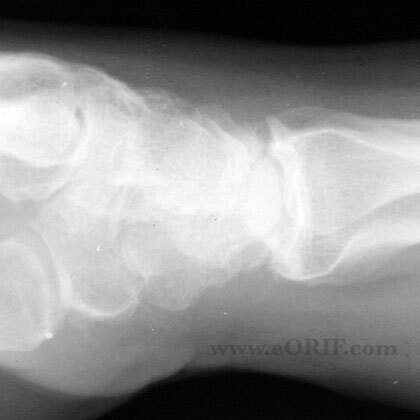 Arthrodesis is favored due to arthritic changes in the capitate. Non-operative treatment = splinting, activity modifications, NSAIDs, steriod injections.